'Coconino' (Marky Smith, R. 2009). Seedling 04-11S. SDB, 13" (33 cm), Early bloom. Standards oyster cream (RHS 160D); style arms pale grey, crests oyster cream; falls blackened mulberry (slightly blacker than 79A), cream (160B) wire rim, cream feathers around beard; beards yellow orange in throat, yellow tipped cream in middle, cream at end; ruffled. 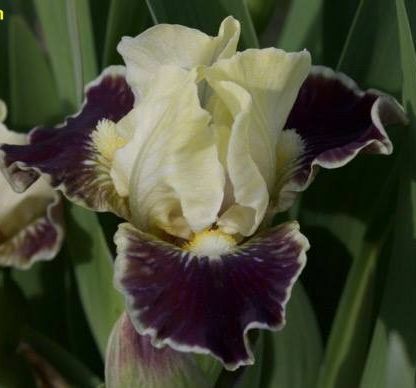 P. Black seedling B279A,'Puddy Tat' sibling X seedling 02-09A: ('Ajax The Less' x ('Captive Sun' x 'Minidragon' sibling)). Aitken's Salmon Creek 2012. Honorable Mention 2014, Award of Merit 2017.